Right now, Samsung’s Galaxy Fold and Huawei’s Mate X represent two opposing viewpoints in foldable phone design. 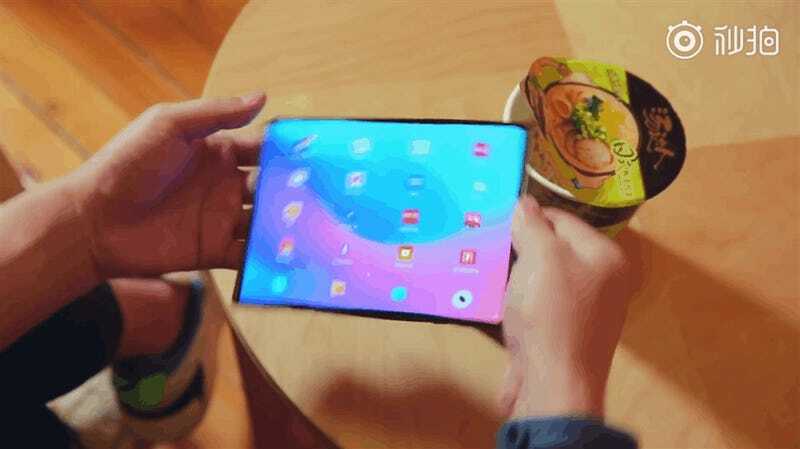 And while Xiaomi still hasn’t set a release date for its upcoming flexible handset, a new teaser video for Xiaomi’s Mi Fold shows that more combatants are still to come in the upcoming bendy phone wars. Featuring a bi-fold design that uses a fixed central display with two wings that unfurl from either side, the Xiaomi Mi Fold’s core design has more in common with the Mate X than that Galaxy Fold. That’s because like the Mate X, the Mi Fold sports a flexible screen that folds outwards instead of inwards, with the main point of differentiation being that Xiaomi’s take requires two hinges to fully support its big, bendable screen. While that might not sound important, the Mi Fold’s dual-hinged design means that when fully expanded, it’s screen is closer to the traditional 16:9 ratio used in traditional phones and tablets than both the Galaxy Fold and Mate X, which sport nearly square displays. That difference sets up the Mi Fold as being the best foldable phone for watching movies and TV, as it will have the least amount of space wasted on letterboxing. Additionally, the Mi Fold’s main screen seems to offer another advantage, especially compared to Samsung’s Galaxy Fold. After seeing the Mi Fold and getting the chance to go hands-on with the Mate X, I think the biggest weakness for Samsung’s Galaxy Fold isn’t its thickness or its alleged crease, but rather the small 4.6-inch “Cover Screen” Samsung features on the exterior of its device. In today’s smartphone market where finding a device with a screen smaller than five inches is damn near impossible, 4.6-inches seems minuscule. And to make matters worse, the size of that 4.6-inch “Cover Screen” relative to the actual exterior dimensions of the Galaxy Fold gives the Galaxy Fold massive bezels that create the impression that there’s a lot of wasted space. The worry is that with a screen that small, doing everyday stuff on the Galaxy Fold like looking up directions, browsing the web, or taking a picture is going to a real pain unless you fully open up the device—something you might not want to do while walking down the street. On the other hand, the Mi Fold isn’t perfect either. The major downside of Xiaomi’s design is that while the center portion of the Mi Fold’s screen looks to offer a lot of room for apps, it’s also quite wide even when its bendable wings are folded away. That could make the Mi Fold feel awkward and cumbersome, not to mention that the Mi Fold appears to be as thick, or possibly thicker than the Galaxy Fold, which is rumored to sit somewhere between 15 and 17 millimeters. However, the most tantalizing thing about the Mi Fold is that it could be the least expensive foldable phone yet. Currently, Xiaomi has a policy that dictates that profit margins for the company’s hardware division will never exceed five percent, a strategy that allows Xiaomi to price devices like the Xiaomi Mi 9 at under $450 even though that phone sports flagship-level specs. That said, we’re probably still talking about something will cost around $1,000. But when you compare that to the $2,000 and $2,600 price tags for the Galaxy Fold and Mate X, the thought of buying a folding phone seems a lot less ridiculous.